If FriendFeed displayed only video, it might look like Utagoe Live 100. The service lets you track live video streams from all of your friends on one screen. Tokyo-based Utagoe just launched it as a hub for broadcasting and watching multiple, free live video streams simultaneously (from sites like Qik, Ustream, Justin.tv etc. ), video-based chatting and conferencing. Aiming mainly at the U.S. and European markets, the service is available in English. 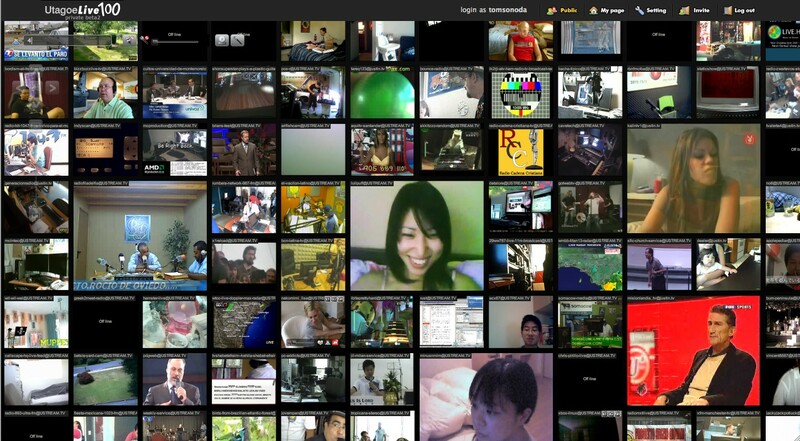 Utagoe Live 100 is browser-based and, as its main selling point, requires just a 400 kbps Internet connection to display around 100 different live streams on one screen (settings can be individually adjusted). The underlying technology, dubbed “traffic controller”, is self-developed. The Flash-based site has an uncluttered structure and features a very straightforward UI. 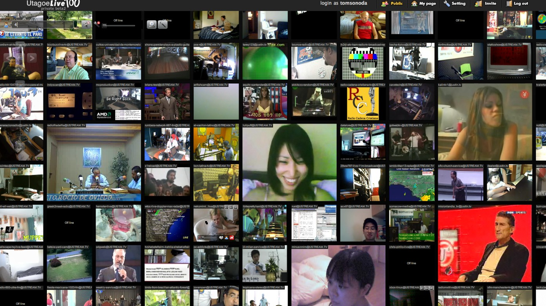 Users can change the size and order of every window and also customize the entire grid of videos. The RSS function allows users to add live streams from friends and other sources to their “My page” with two clicks (Utagoe calls this “importing”). Like FriendFeed and Twitter, friends can follow each other’s status. It’s possible to communicate with friends by typing text messages (via speech balloons overlaying the video stream). I tried out the application, which is in public beta, and it worked flawlessly, even with my mediocre PC and Internet connection. What Utagoe Live 100 needs in future versions to appeal to more users is an automatic pre-categorization of video sources and topics, an opt-in solution for adult-oriented streams and a ranking function for members wanting to cut the noise. But with streaming picking up speed as a mass phenomenon, Utagoe might well find its place in a lucrative niche. Utagoe Live100 demo from utagoe on Vimeo.